The Blot Says...: Lobo Pop! DC Comics Vinyl Figure by Funko - A Previews Exclusive! Lobo Pop! DC Comics Vinyl Figure by Funko - A Previews Exclusive! The Main Man is finally here! The Blot was thrilled to learn a few months ago that Funko was going to add Lobo Pop! vinyl figure to its popular line of DC Comic Pop! Heroes. Now all you bastiches can add the last Czarnian too your Pop! Heroes collection. While Lobo hasn’t gotten much love the past two decades since his heyday as one of DC’s most popular heroes in the ‘90s, but he made a triumphant return in the Justice League vs Suicide Squad min-series last year before ultimately joining a new version of the Justice League. Now Lobo’s return to prominence is complete with this Pop! release! 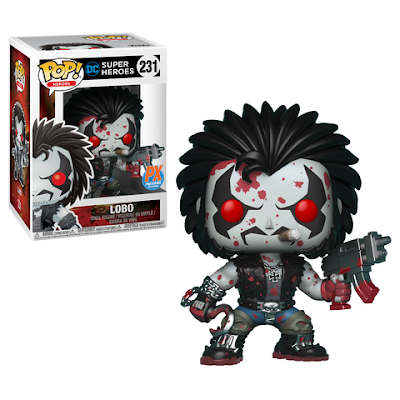 The Previews Exclusive Lobo Pop! Vinyl Figure stands 3.75” tall, has a rotating head and comes in a displayable window box. It is currently available in specialty stores and comic book shops everywhere in a Regular Edition and a very cool Blood Splattered Edition. Collectors can order this awesome DC Universe figure now at Entertainment Earth for $12.99 each here.